Asian markets are trading slightly lower especially Nikkei declined slightly on account of profit booking. Fed believes that US growth to be eased this year on government shutdown and ongoing trade war tension between US and other countries according to minutes released on Wed .Fed has made clear that balance sheet normalization will end by latter half of this year and to follow wait and watch approach on interest rate. US and China trade talks going very well and US President Trump said that Mar 1st deadline for China trade talks not magical date. 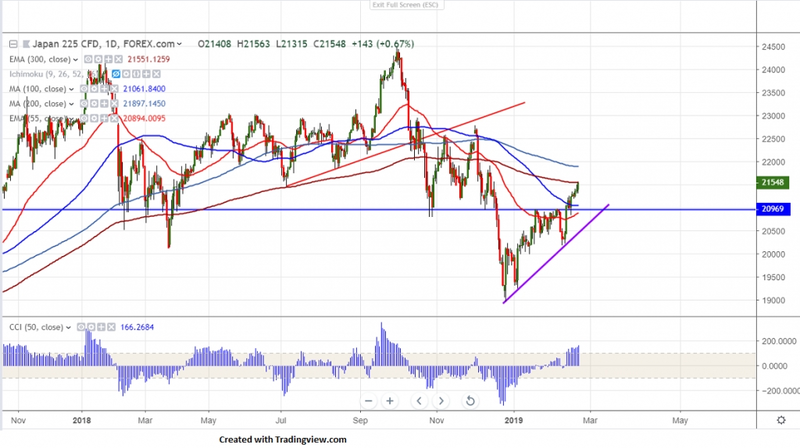 Is supporting global markets.US market has closed flat with Dow Jones at 25954 (0.24% higher) and S&P500 2784 (0.18% higher).The dollar has gained slightly`till 110.95 and shown a minor weakness. USDJPY is facing strong resistance around 111.40 and is currently trading around 110.81. On the lower side, near term support is around 21000 and any break below targets 20630/20450/20170. The index should break below 20000 for further direction. The near term resistance is at 21550 and any break above targets 21700/21918. It is good to buy on dips around 21150-200 with SL around 20900 for the TP of 21500/21700.